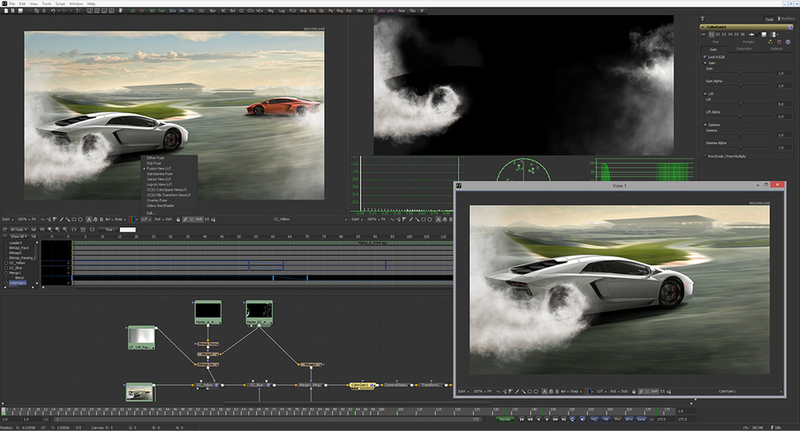 [ #Compositing ]First-ever Mac-compatible release of visual effects and motion graphics software to be followed by a public beta for Fusion 8 Studio, which adds stereoscopic 3D tools and is designed for multi-user workgroups. Fremont, CA -- Blackmagic Design has announced that the public beta of the free version of Fusion 8 visual effects and motion graphics software is now available for download from the Blackmagic Design website. This beta is for the free version of Fusion 8 and is available for both Mac OS X and Windows. A beta for the paid version, Fusion 8 Studio, which adds stereoscopic 3D tools and is designed for multi user workgroups and larger studios, will be available shortly. However, current Fusion Studio customers can download the public beta for the free version of Fusion 8 and start using it today. This public beta is also the first ever Mac compatible release of Fusion, which was previously a Windows only product. By bringing the free version of Fusion 8 to the Mac, high end visual effects are available to even more users than ever before, opening the door to millions of motion graphic artists, broadcast designers, video editors, visual effects compositors, and 3D animators. In addition, projects can be easily moved between Mac and Windows versions of Fusion so customers can work on the platform of their choice. Now, anyone with a Mac or Windows computer can get access to the same high end visual effects tools used by Hollywood’s most elite artists. Longtime fans of Fusion will also notice that in the 6 months since Fusion 8 was launched at NAB there has been many improvements to the user interface and Fusion customers will appreciate the more modern look of the software. There will be many more improvements to the user interface as the Fusion engineering teams continue to work with the visual effects community. Fusion has been one of Hollywood’s leading visual effects and motion graphics tools for over 25 years, and has been used on thousands of feature film and television projects, including blockbusters like Thor, Live Die and Repeat, the Hunger Games trilogy, White House Down, Battlestar Galactica and more. Featuring a powerful node based interface, Fusion makes it extremely easy to build sophisticated visual effects compositions very quickly. Nodes are small icons that represent effects, filters and other image processing operations that can be connected together in any order to create unlimited visual effects. Nodes are laid out logically like a flow chart, so customers won’t waste time hunting through nested stacks of confusing layers with filters and effects. Unlike timeline based applications, it’s easy to see and adjust any part of a project in Fusion by simply clicking on a node. With a massive toolset consisting of hundreds of built in tools, customers can pull keys, track objects, rotoscope, retouch images, animate titles, create amazing particle effects and much more, all in a true 3D workspace. Fusion can also import 3D models, point cloud data, cameras or even entire 3D scenes from Maya, 3ds Max or Lightwave and render them seamlessly with other elements. Deep pixel tools can be used to add volumetric fog, lighting and reflection mapping of rendered objects using world position passes so customers can create amazing atmospheric effects that render in seconds, instead of hours. Fusion 8 for Mac and Windows is free for customers and the public beta of Fusion 8 is now available to download. Fusion 8 is a full professional 3D visual effects and compositing system that is suitable for independent effects, motion graphics, and broadcast design artists. Fusion 8 features integrated 2D and 3D compositing and motion graphics software with a massive toolset featuring paint, rotoscope, titling, animation, multiple keyers, an amazing 3D particle system, advanced keyframing, GPU acceleration, and support for importing and rendering 3D models and scenes from other applications. Fusion 8 Studio, will be available for Mac, Windows and Linux for $995 and the public beta will be available soon. Fusion Studio has all of the same features as the free version, but also adds advanced optical flow image analysis tools for stereoscopic 3D work, retiming and stabilization. Fusion Studio also includes support for third-party OpenFX plugins, unlimited distributed network rendering, and Generation for studio wide multi user collaboration to track, manage, review and approve shots when working with large creative teams on complex projects. Fusion 8 Public Beta is available today for download from the Blackmagic Design website free of charge. Fusion 8 Studio Public Beta will be available soon and will be available to download from the Blackmagic Design website free of charge for all current Fusion 7 Studio customers.